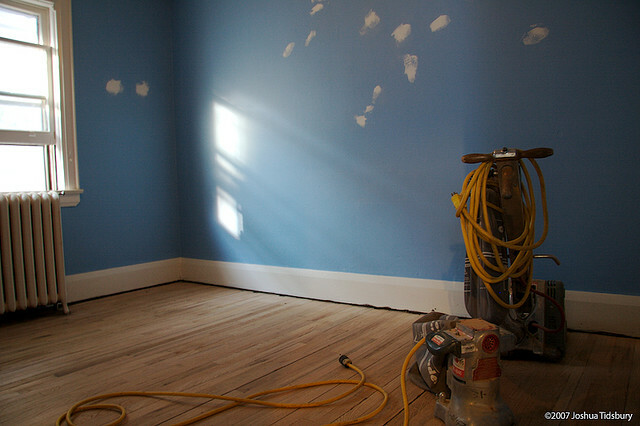 Just like any good decoration project, color painting hardwood floors begins with good preparation - as tiresome as it is, you really will reap the rewards later. The first step is to remove the existing finish from the floor. It depends what state the floor is in, as to which method you use. If the existing finish isn't too thick then a sander may be up to the job. If the existing finish is likely to be troublesome then you may need a paint or varnish remover. Electric sanders can be hired to make quick work of preparation, and when using them be sure to sand with the grain, for a smooth finish. If you are using a chemical remover you need to allow plenty of time for these to take effect, and to allow sufficient time afterwards to get rid of the fumes and damp, that the solution leaves behind. Specialist floor paint has been manufactured specifically for its purpose: that is, to be hardwearing. You cannot use just any kind of paint, as before long it will be showing up marks, and getting scraped off the floor when wearing shoes. You need a paint that is fit for the job. Many paints are suitable for painting concrete floors as well as wood floors, but be sure to check the information on the pot before you buy. Consider too, what kind of finish you want, for color painting wood floors in your home. For painting a square design like the one pictured above, you are replicating a tile, so you want something with a slight sheen like a satin finish paint. If you want something to reflect the light and make a room feel bigger then a gloss paint is ideal, whereas using a matt finish adds a sense of depth and warmth to a New England style space. Look out too for quick drying floor paints - a whole room will be out of action as the paint dries so it is worth investing in one that will reduce the drying time if you can. If you don't want to just paint the entire wood floor in one color, then there are designs that are easy to achieve. To replicate a diagonal square pattern, requires lots of patience and masking tape, but may also prove quicker than diagonal tiling. A typical square floor tile measures 12x12 inches, so use this as your guide when measuring out. Use a chalk line (plumb line), or a spirit level, and measure out points every 12 inches, marking with the chalk or a pencil. If your space fits into increments of 11 inches better, then of course adapt as necessary to make the process easier. With the squares measured out paint in your "white" squares - you don't need to worry about going over the lines at this stage. 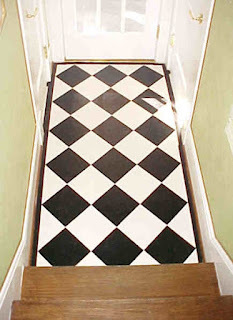 When the paint is dry, use a low-tack masking tape to mask out all the "black" squares. When the paint is tacky but not dry completely, remove the masking tape. 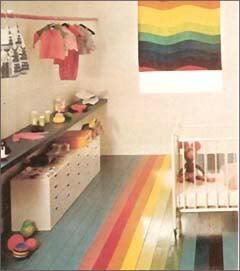 You can add painted color to a wood floor in less dramatic ways too. Again using a plumb line and spirit level, mark out a simple border around the room to create visual interest - a narrow border gives the illusion of more space, whereas as wider border makes a more dramatic statement. Again use masking tape to ensure a neat edge, and remove when the paint is tacky. If any of these ideas for color painting hardwood floors doesn't appeal to you, then you might want to try something a little more detailed, like using stencils for your floor painting. great advice - last thing you want to do is ruin great floorboards. Different if your painting over vinyl or inferior quality wood. BTW I love the checkerboard pattern!